Thirsty Pilgrim: Yet They Never Ask What I Think of Belgian Cheese. Yet They Never Ask What I Think of Belgian Cheese. Since I live in Belgium, friends often ask what I think of the political situation here. Since I'm from Missouri and used to live in St. Louis, they also ask what I think of InBev buying Anheuser-Busch. But opinions are like assholes, and so am I.
Monday was Belgian National Day. As my man Rich and I went from pub to pub, we saw a lot of national flags waving and impressive military jets flying overhead. Lots of unity on display. But it's easy to show unity in Brussels, which speaks French yet is the capital of Flanders. We marked the occasion at the great Poechenellekelder by drinking a brand spankin' new beer from Brasserie de la Senne: the Jambe de Bois. Subtitle: "Belgian Revolution Tripel." Like most tripels, it is sweetish and strong (8% abv) with yeasty orange-citrus and some herbs in the aroma. It had a dryish, hoppy edge like other Senne beers. I'd love to try it with some creamy, funky Herve cheese. That's from Belgium, you know. "Jambe de Bois" means wooden leg, incidentally, and the beer's name honors a hero of the 1830 Belgian Revolution who had, well, a wooden leg. What will happen to those heroes if the country splits? What will happen to the significance of the Place des Martyrs in Brussels? Did you know the remains of 466 dead guys are buried under there? Flemish and Wallonian and Bruxelloise. Did they die just so they would be neither Dutch nor French? Before our recent trip back to the States we went to the Weekend of Spontaneous Fermentation in Opstal. 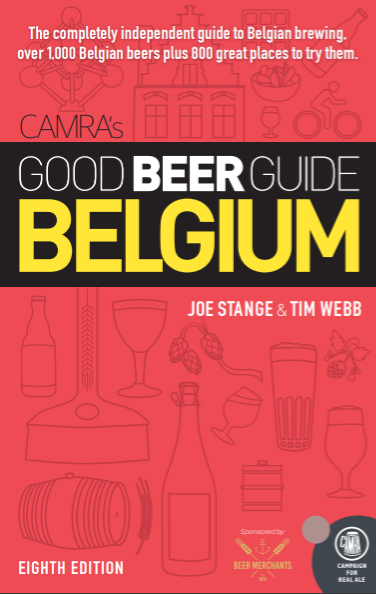 Author and publisher Tim Webb gave a seminar on lambic and mentioned this little problem: What happens to Belgian beer if theres no Belgium? Wallonian beer, Flemish beer, Brussels beer... Doesn't have the same ring. 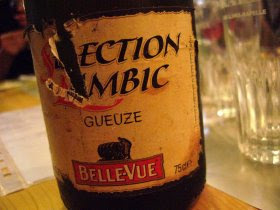 A highlight of that weekend was getting to try an ancient ('92) bottle of Belle-Vue Selection Lambic. Very lemony-sour, pretty acidic, and damned interesting. But if it mellowed with age, I'm glad I didn't try it 16 years ago. There may be a practical application for that stuff in car batteries. Belle-Vue, by the way, is now an InBev beer. Soon to be Anheuser-Busch InBev. One global company buying another. In Missouri and other states, people will lose jobs and charities will lose money. Where am I going with all this? Oh yeah: I love Belgian cheese.